The story thus far: Dante, a poet and town prior in Florence, finds himself on a dark road of the soul. Before his spirit can fall to its ruin, he encounters Virgil, the greatest poet of classical Rome. Virgil, at the behest of Beatrice, a woman who was Dante's inspiration in life, offers Dante a journey through the realms of the afterworld, through which Dante may find his soul's salvation. He shall travel through Hell, Purgatory, and Heaven, with Virgil as his guide through the first two. Dante accepts Virgil's offer, and they embark. After passing through the gates of Hell, they encounter the souls of the cowards who took no stand in conflicts between good and evil, and then proceed to Limbo, the realm of the noble or innocent souls who were not baptized or otherwise not believers in the Christian faith. 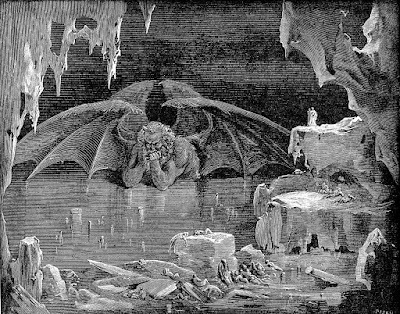 Dante and Virgil then travel through the first circles of damnation and the city of Dis, which punish those who embrace earthly appetites and goods at God's expense. Upon leaving the city, Virgil explains the plan of Hell to Dante. The circles that follow hold, in descending order of heinousness, those who commit violence, fraud, and betrayal. In the circle of the Violent, they encounter murderers, merciless conquerors, suicides, and those who squandered or destroyed their belongings. From there, they walk alongside a desert where fire rains down. It is the prison for those who were violent against God and nature, including blasphemers, sodomites, and usurers. Dante and Virgil then descend to the circle of the fraudulent, where they encounter the panderers, seducers, flatterers, corrupt clergy, fortune-tellers, diviners, and grafters. The last are overseen by a gaggle of demons, from whom Dante and Virgil must escape. They then encounter the religious hypocrites and the thieves. Next are the false counselors, including Odysseus, who tells Virgil of his final voyage, and Guido da Montefeltro, who was damned by his sinister military advice to Pope Boniface VIII. Those who sowed division are next. After them are the falsifiers, whose numbers include the alchemists, impersonators, counterfeiters, and false witnesses. With the help of the giant Nimrod, who built the Tower of Babel, Virgil and Dante reach the lowest level of Hell. There they find, embedded in a frozen lake, those guilty of treachery. They stop at the sight of Count Ugolino of Donoratico gnawing on the head of the Archbishop Ruggiero. Ugolino relates the story of how he and his four sons were betrayed by Ruggiero. They were sealed in a tower and starved to death. Virgil and Dante proceed to Ptolomea, which holds the souls of those treacherous in the face of hospitality. There they discover Branca d'Oria, whose damned soul is captive in Hell although his body still lives on Earth. There in the distance appeared a mill turning the wind. My Master, as there was no other shelter. Showing through like straws in glass. Some lay prostrate, and some stood erect. There were those on their head, and those on their feet. Another was bent face to feet like a bow. He stopped walking in front of me, and made me stop as well. Because words will not suffice. I did not die, and I did not remain alive. What I became, deprived of one and the other. Than giants would with his arms. All sorrow may very well come from him. When I saw on his head three faces! The one in front—that was a vermilion red. And they were all joined at the crown. The coloring of the one on the right appeared between white and yellow. Come from where the Nile descends. I never saw sails at sea like these. So that three winds came forth from him. They were what kept all of Cocytus frozen. Ran tears and bloody drool. With his teeth the way a rake does with flax. And so the three were kept in agony. Was left completely flayed of skin. Who inside has his head and outside kicks his legs. The one that hangs from the black mouth is Brutus. See how he writhes, but makes not a word! The other is Cassius, who looks so brawny. At his request, I put my arms around his neck. Through the matted fur and crusts of ice. And grabbed hold of the hair like one climbing. And so I thought we were returning to Hell. And put me on the edge to sit. His ingenious footwork brought him up to me. But I saw his legs suspended above me. What point it was that I had passed. “Get up,” my Master said. “On your feet. The way is long, and the road is hard. One with a broken floor and poor light. Of the pelt of the evil worm who pierces the world. You were on the other side while I descended. Where weights from everywhere are drawn. The Man who was born and lived without sin was done. That forms the other face of Judecca. It is morning here when it is evening there. He is still ensnared as he was before. He fell from Heaven on this side. By its winding course and soft incline. Entered to return to the shining world. Heaven holds, all through a round hole. And through there we exited to once again see the stars.